Elgin watch serial numbers can be used to determine an approximate date of manufacture, and other information. The date is not exact because plates were often made, with numbers, and stockpiled for later use, sometimes years later. But a general idea is available. Note that the serial number this information refers to is the number appearing on the movement itself, on the works of the watch, on the inside. Numbers on any part of the case refer to the case and not the Elgin watch movement. Check here for information on how to open a pocketwatch case, to access the movement number. If your serial number begins with a number, it is a later model. More on that here. 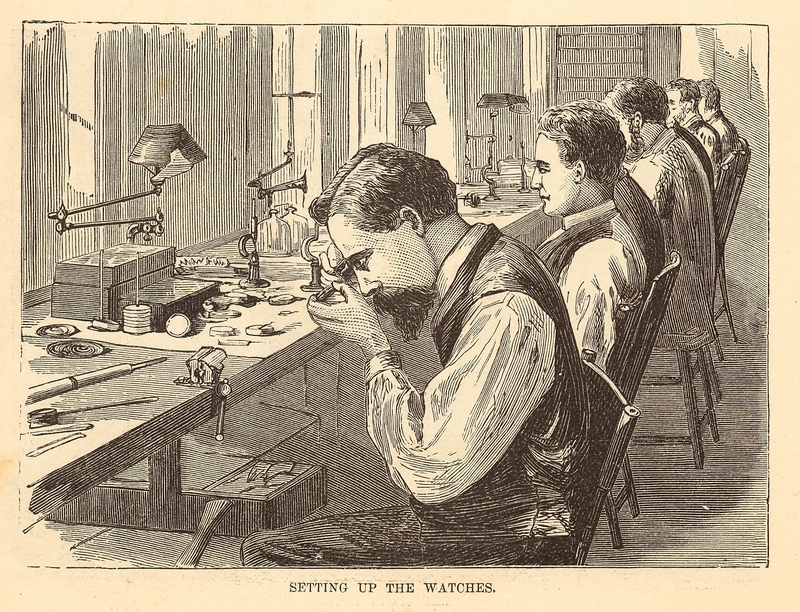 The Nation Watch Company, later known as the Elgin National Watch Company, was founded at the end of the Civil War, in 1864, in Elgin, Illinois. The first Elgin pocketwatch was an 18 size movement given the number 101, made in 1867. The serial numbers run from there up to the ballpark of 55 million, which is a lot of watches! For just a rough estimate of the age of a movement however, given the serial number, the following table is widely accepted.